After our stressed-out rush to get to the airport, we found a line hundreds of passengers deep waiting to check in. Many had multiple oversized suitcases. “Maybe the line will move fast,” said Lynn. She’s such an optimist. After 15 minutes it hadn’t moved at all. Another Avianca agent came along, asking if anyone was there for the 10:30am flight to Bogota. This is one of those times when knowing some Spanish is really helpful. I raised my hand, and Lynn and I were led away to the front of the line. Heh, heh, heh. Or jeh, jeh, jeh as it would be in Español. We had two hours to kill in Bogota airport, so naturally we reverted to checking on what our friends and family were up to back home via social media. When traveling in an exotic place, it’s important to keep up with the new Tater Tot hot dish recipe your aunt has tried, the political views of a friend of a friend you talked to for one hour five years ago, and the antics of your ex-coworker’s cat. 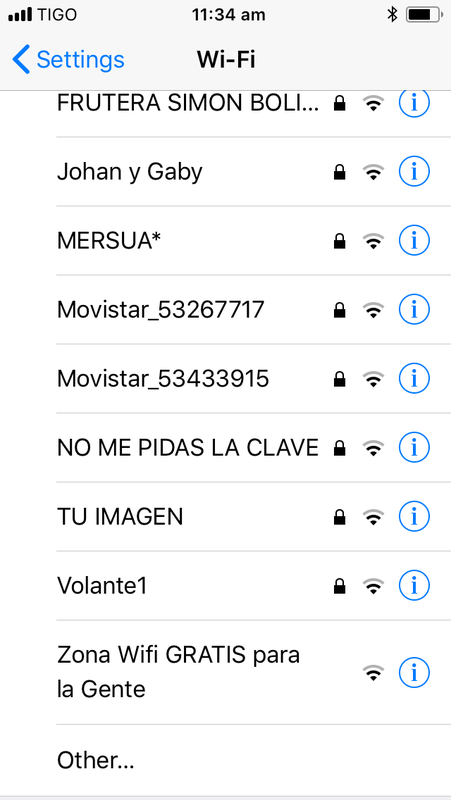 In the four Colombian airports we visited, the wifi networks were straightforward. Maybe this is, ironically, due to fewer terrorism regulations than in the US and Europe, where—at least the first time—you have to give them you name and email and sometimes your address and phone number, and sometimes create a user name and password, and it still takes forever to actually get access. So “Zona Wifi GRATIS para la Gente” (Free Wifi Zone for the People) isn’t secure. So what? It’s not like I do online securities trading at the airport. Responsible Travel had messaged several times to check we were on track and apologizing for the morning’s no-show driver. In retrospect, knowing everything turned out okay, it doesn’t seem that stressful of an occurrence but it was at the time. “He was clearly unhappy about something when he picked us up in Medellin,” I remarked to Lynn. We shrugged and turned back to Facebook. It was one of those mysteries that happen when you travel that you’ll never get an explanation for and it doesn’t matter, as long as ended well. We exited the second flight in Santa Marta mid-afternoon, and I couldn’t help sighing happily out loud because it was hot and humid, even inside the airport. You could feel we were near the sea. Our driver was there to take us on the 1.5-hour drive to Tayrona National Park. He pulled over after a minutes and a second guy jumped into the truck. “Mi amigo,” he explained. Just going along for the ride, apparently. Santa Marta was not particularly scenic, at least along the highway. It’s a beach holiday destination, so I’m sure it’s much prettier close to the beach. This entry was posted in Adventure, Budget travel, Culture shock, Travel and tagged Colombia, Medellin, Santa Marta, social media on April 30, 2018 by Breaking Free.